Traditional home remedies use banana stem for various purposes. 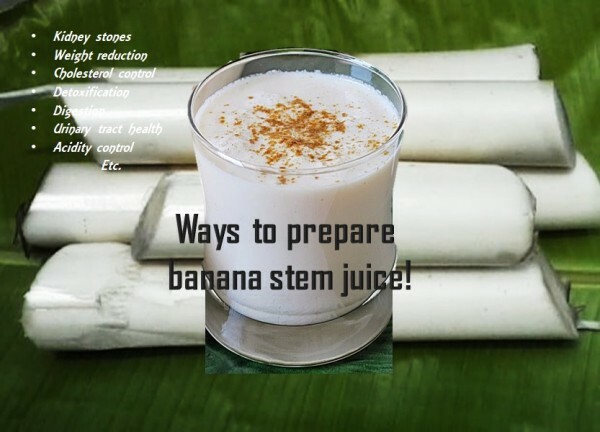 One use of banana stem is reducing kidney stones and to get rid of pain associated with it. It also helps to reduce weight by reducing fat and reduces obesity. Apart from these consuming banana stem also reduces acidity and cholesterol level. Preparation: Grind the contents. Add 2 cups of water to grinder and continue grinding. Strain content to a drinking cups and consume. Preparation: Grind soaked banana stem piece along with water. Strain to a cup and add rest of the 2 ingredients. Mix well and drink. Type 3: For obesity, digestion and weight reduction. Preparation: Grind banana stem and apple pieces together by adding 1 cup water. Strain and add lime juice, salt and sugar. Mix well and drink. Preparation: Grind all ingredients together by adding 2 cups water. Strain content and drink.